Just a quick post today because it’s the first day of spring and I wanted to celebrate by eating some asparagus. I was thinking of making pasta primavera but most recipes use cream and I didn’t want to buy some cream, use a small amount and have the rest waste away in the refrigerator, only to be thrown out a few weeks later. So, this noodle dish made the grade: it’s vegan, packed with veggies and makes a fantastically quick and simple lunch. 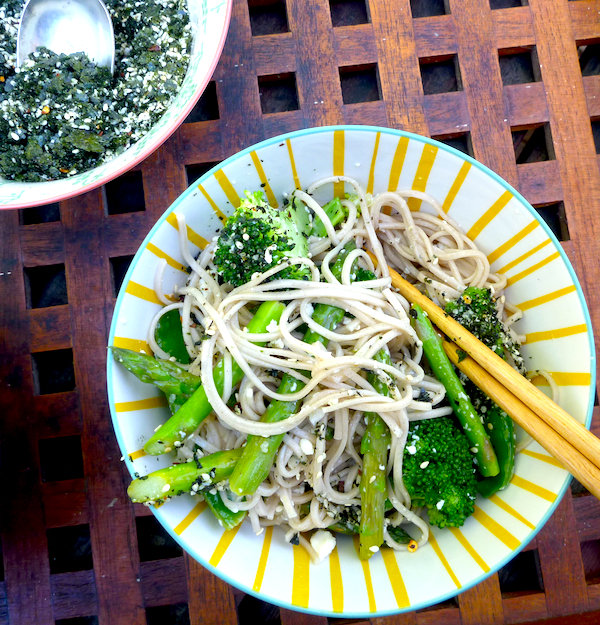 The nori and sesame sprinkle is very good – make a double batch and use it over the week is my advice. It’s like a super quick homemade furikake: the dressing has quite a bit of ginger in it but it’s very good that way, with lots of zing. The recipe comes from Jamie Oliver’s new book, Every Day Superfood, which seems very much part of the zietgeist at the moment: it’s all about cramming more nutrient dense ‘superfoods’ into our diets. Make dressing – peel ginger and garlic and grate finely into a bowl. Add the zest and juice of one lime. Mix in soy, sesame oil and vinegar. For the sprinkle – tear nori into pieces and blend until fine. Toast sesame seeds and chilli flakes in a cast-iron pan until sesame seeds are lightly golden. Add a pinch of salt and black pepper (or sprinkle? ), lace in a blender and mix until combined. Place a steamer over a pan of boiling water. Trim asparagus, then cut in half at an angle. Break broccoli into small florets, peel and slice stalk. Place snap peas, asparagus and broccoli in single layer and steam until just tender but still green and with a slight crunch. Cook noodles according to packet instructions. Drain and reserve some of the cooking liquid. Toss noodles with veggies, cubes of tofu and dressing. Loosen with some reserved noodle water, if needed. 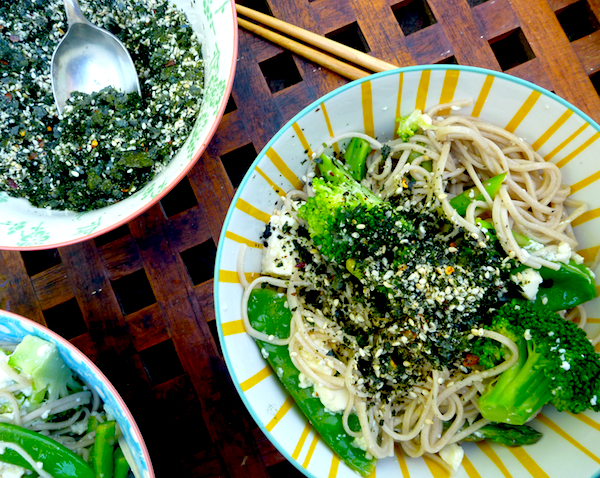 Scatter over some of the sesame nori, sprinkle and serve with extra lime wedges if desired.